Anyone who's read this blog in the last two weeks knows that I've been harping about Mississippi State's screen pass defense. 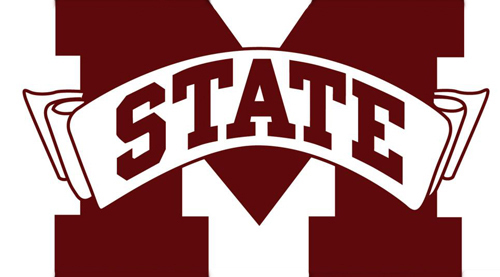 I finally had a chance to sit down and watch the MSU/Arkansas game over the weekend--I wanted to watch it primarily to see how Chris Relf finished the game 20/30 for 224 yards (the short story: tons of protection in the pocket, about which more probably tomorrow)--and saw yet another instance of Mississippi State's flimsy defensive numbers. 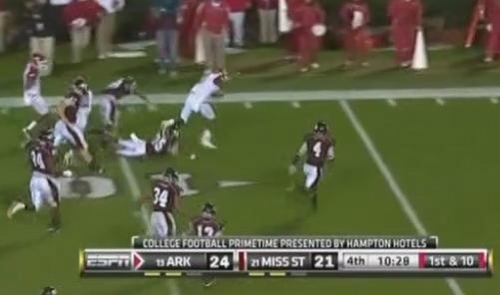 Mississippi State was a little disorganized before the snap but was able to get into place just as Ryan Mallett pulled away from center. Arkansas is in a single-back set with trips to Mallett's left and a tight end on the weak side of the field. By this point, you can probably already see the problem with the Bulldogs' alignment: they have two defenders (almost three with the strongside linebacker who's standing at the 20 yard line) to cover three Arkansas receivers. 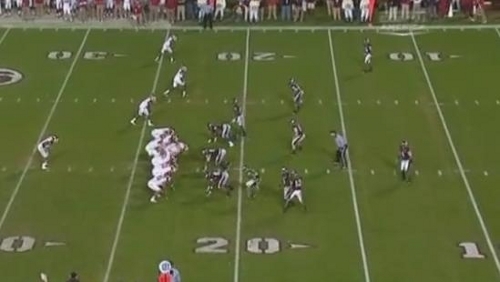 On the snap, you see the H-receiver head out to the flat for the screen pass. The two outside receivers start to head upfield to block. The strongside linebacker who was rolled up to the line of scrimmage sees the H-back headed out for the screen pass and starts to run with him. 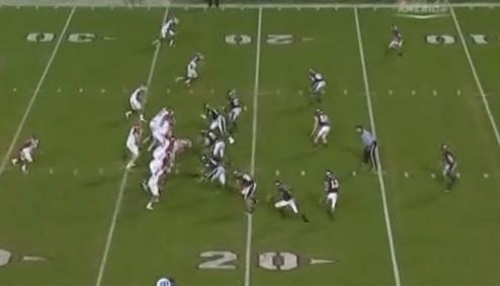 However, he's already a few yards behind the receiver horizontally. Mallett has thrown the screen. The two outside receivers are still headed upfield to block the safety and cornerback that were covering them. The strongside linebacker may be able to make a tackle on this play if he takes the right angle, but it'll be difficult because the H-receiver already has momentum and a step on him. The H-receiver now has the ball and is turning upfield. His blockers are about to engage the only defenders that were on the strongside of the field. The playside linebacker gets close to making the play but dives and can't quite get there. The outside receivers are now laying blocks on the DBs down the field. The middle linebacker (#50) is crashing on the play as hard as he can but similarly won't make it in time. The H-receiver will end up falling just inside the five yard line. 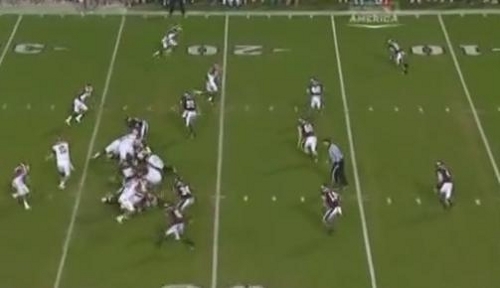 Like I mentioned above, this is not an isolated incident: Mississippi State's screen defense is structurally unsound, and that's because they play a heavy-blitzing style. Unless they switch up their defensive schemes significantly against Michigan, I anticipate RichRod checking to this play frequently at the line of scrimmage when he sees a favorable alignment. MSU will attempt to counter this by crashing their DBs into the backfield to intercept/swat balls, but that can be easily expoited with vertical routes by the outside receivers. Michigan will go to these bubble screens often against Mississippi State, or at least until it slows down their blitzing schemes and opens running lanes for Denard and company. Roy Roundtree's ability to hold onto the ball will be crucial here, and I also expect to see Vincent Smith headed out to the flat to catch screen passes from time to time. This should conclude my obsession with the Bulldogs' screen defense. Hopefully. We haven't used the bubble much this year but it does appear that it will be a viable weapon in this game. Denard's accuracy will be key as he has had a tendency to make the catch difficult when we have dialed it up. It would be nice to get one of the quicker slot ninjas (Gallon, Grady, perhaps T. Rob) some chances to make plays in space as Roundtree isn't quite as dangerous after the catch (at least theoretically) as those guys. Eventually we're going to put all these shifty slot guys to use, right? Meanwhile, if we can hit a couple decent gainers it should open up the fake bubble that worked so well against UConn and OSU. Agreed. One of the reasons Michigan has gone away from the bubble screen this year is because teams are purposefully compensating for it. They'll shift a fourth defender onto the strong side of the field to have numbers against trips, which has helped open up running lanes for Denard and company. Mississippi State, however, appears to be opposed to doing that against trips sets, and I don't imagine that tendency will change against Michigan.